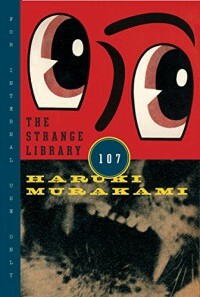 The Strange Library has all of (or almost all of) the elements of a Murakami story that I love, distilled into one quick read. The illustrations and the recurrence of familiar Murakami themes and characters/character-types serve to elevate the story's dreamlike atmosphere. It was made both familiar and strange, as the best/worst dreams often feel. That said, those unfamiliar with his work will probably finish this with a sense of "what the f did I just read". It would be unfair to compare this to his novels. It's an experiment and a way for Murakami to play with new formats and new methods of expression. I for one really enjoyed it and hope he takes the experiment further next time. I haven't quite worked out exactly what he's saying, I only just finished it 20 minutes ago. But I suspect that as with any other parable, or any other Murakami story for that matter, its meaning will become clear (and change and evolve) the longer I sit with it. What I do know is that I had an immediate emotional response and that's usually the first phase in understanding Murakami for me. I think those writing The Strange Library off as a failed attempt at scaring children into behaving are missing the point - taking it too seriously and too literally. I think it was originally published for adolescents, but being familiar with Murakami's decidedly NOT kid-friendly work makes this of interest to adults too.